The Shark wireless charger is a very simple and straight forward product by inCarBite from California. Because of this simplicity, inCarBite can make the road safer for everyone. The Shark is designed to minimise distractions while driving by having your smartphone out of sight while charging your device. It’s simply a drop-and-go wireless charger. There’s no need to find a sweet spot or to align it perfectly to charge your Qi-enabled device. inCarBite uses a patented pocket holder design for their Shark wireless charger making it easy to wirelessly charge your smartphone. It has 3 charging coils positioned in a way to be able to charge any Qi-enabled device no matter the position. It also offers 2 USB capable of outputting 5V/2A of power, enough for the larger devices such as tablets and powerbanks. It can also stand extreme temperatures when the car is parked under the heat of the sun. 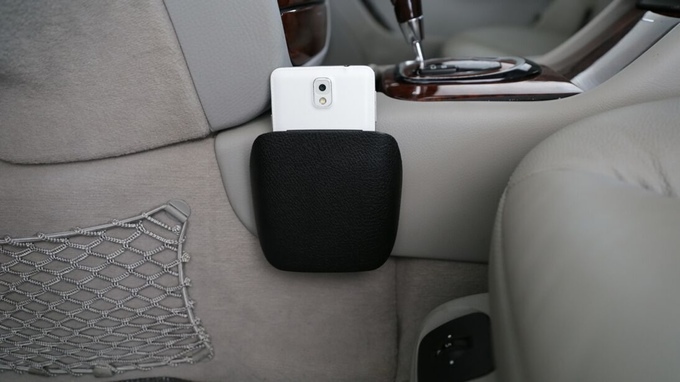 Along with confronting bad weather, the Shark wireless charger is also designed to withstand your clumsiness in the car by being shock proof and water resistant. To install, simply stick the adhesive Velcro pad next to your gear shifter on the passenger’s side. Then just stick the Shark to the Velcro pad, plug it in the 12v socket and drop your Qi-enabled smartphone in. If you want to back this project, head on over to their Kickstarter campaign page and give them a pledge. There’s a $39 option which entitles you to 1 Shark wireless charger package and an Android Qi wireless charging receiver.